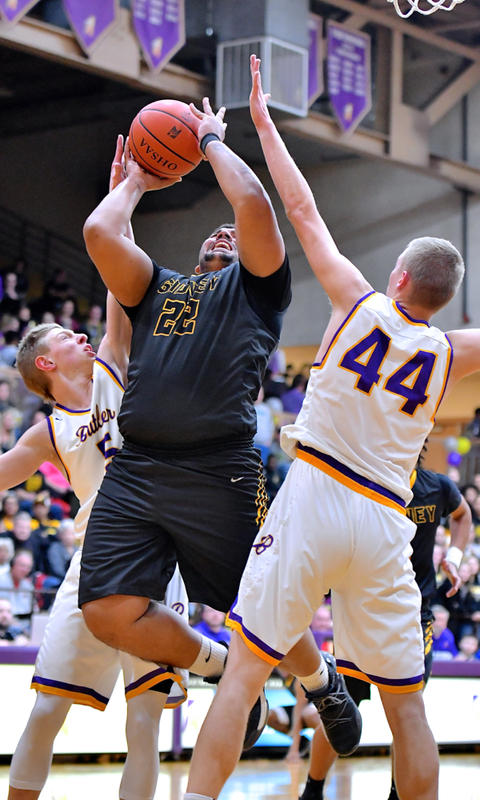 A miserable start turned into a game to remember as Sidney avenged an earlier loss and threw the GWOC American North race into a tie with one game remaining. Vandalia – John Willoughby knew what was coming. Justice Kort has his shot blocked by Ratez Roberts. The Yellow Jackets survived a 1 point first quarter and broke a late tie on a Ratez Roberts lay-in with 2.5 seconds left to beat the Aviators 36-34. Both teams are now 10-3 in the GWOC American North with one game remaining. 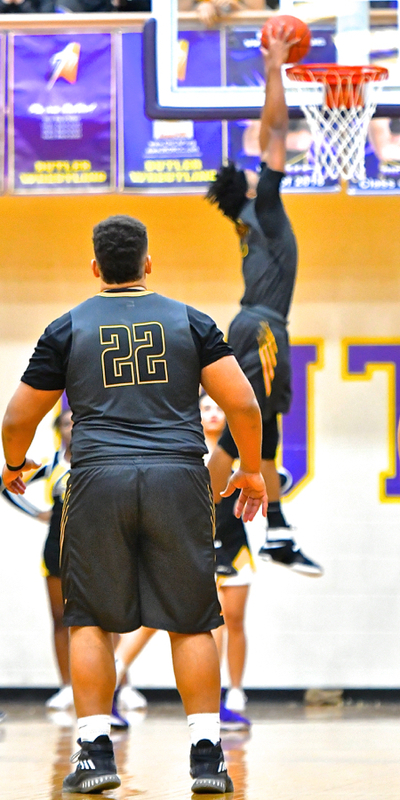 Devan Rogers watches as teammate Ratez Roberts slams one in the hoop. Things got a little better in the second quarter, but not much. Devan Rogers and Darren Taborn made threes in the quarter for Sidney, who led at halftime by the rather ridiculous score of 14-9. 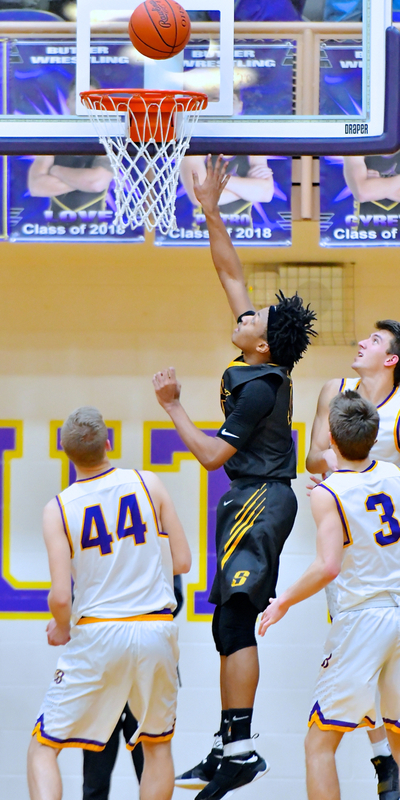 The Aviators, who lead the entire GWOC in points allowed at 46 per game, finally got going in the third quarter. Kort Justice scored 5 points in the quarter, and Ryan Wertz came off the bench to hit a big three. The teams went to their benches after 3 tied at 23, when the game took a strange turn. During the timeout, a technical foul was called on the Sidney bench. Butler couldn’t capitalize on the break, however, and the teams battled down the stretch neck and neck. With the Yellow Jackets up a point, Andre Gordon made 1 of 2 free throws with a minute left. Butler got back even when Justice, who finished with a game high 12 points, knocked down a contested, fade-away jumper from the right baseline with 49 seconds left. Sidney held the ball for the final shot and called timeout with 15 seconds left. With every eye in the Student Activity Center on Gordon, the Sidney junior found another way to break Aviator hearts. Dribbling toward the left wing, he found fellow junior Roberts wide open on the right block. His pass was perfect and so was Roberts’ shot to give the Jackets a 36-34 advantage with 2.5 seconds left. Darren Taborn hit a pair of threes in the second half. Gordon talked about the winning play. Then something that no one could remember happening before. 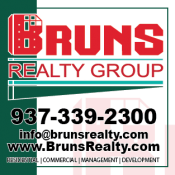 Five consecutive timeouts…two by Willoughby and three by his Butler Counterpart Darren Wyrick, kept fans on the edge of their seats. The Jackets denied Justice the ball, and the in-bound pass went to junior Michael Kreill. He managed three dribbles before launching a shot from about 25 feet above the key. 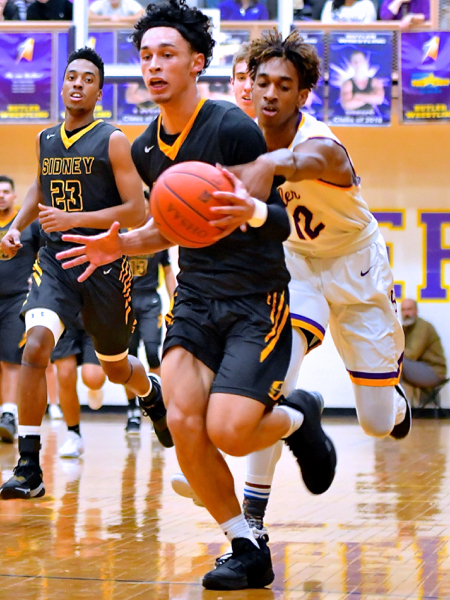 The shot was off the mark, and although the Butler bench thought Kreill was fouled, no whistle sounded and the Jackets escaped with a well-earned victory. For Sidney, now 15-6 and winners of eight of their last nine, Rogers was the only player in double figures with 10. Roberts had 8, Gordon 7, and Darren Taborn hit a pair of threes for 6 points. Andre Gordan gets fouled by Butler’s Bryant Johnson in the 4th quarter. Roberts, who sprained his right ankle against Tippecanoe and missed three games, said he is healthy and ready to go. Willoughby said his team has gained a lot of confidence over the last month. Sidney would seem to have the easier path to the title Friday. 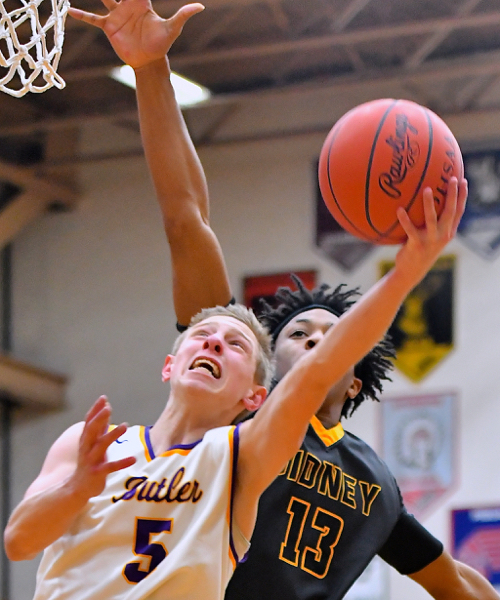 The Jackets host one win Greenville on Senior Night, While Butler travels to Tipp to face a Red Devil team that beat the Aviators earlier this season. Devan Roger’s powers through two defenders to score for the ‘Jackets.